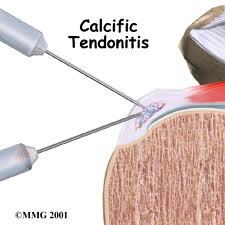 What is the causes of calcific tendonitis? The pain can be constant and nagging and is felt in the shoulder and outside of the upper arm, at times down the arm to the hand- aggravated by elevation of the arm. Night pain is often a feature and pain is intensified when raising the arm. In some instances the pain as well as tingling of the arm and fingers is experienced and may lead the treating physician think of the diagnosis of a nerve lesion of the neck. Some patients experience attacks of excruciating pain, which then abate to a lower level after a few days.